Saturday, October 19, 2013 - 1:00 p.m.
Wilkes University travels to Reading, Pa. to face MAC foe Albright College at Shirk Stadium. Both teams are coming off a bye week. Two weeks ago, Wilkes fell 17-6 against Lebanon Valley College on Homecoming, while Albright posted a 52-7 win at FDU-Florham. Colonels coach Frank Sheptock (Bloomsburg ‘85) enters his 18th year on the Wilkes sideline, racking up a 105-78 (.573) record. With the 105 victories, Sheptock is the all-time winningest coach in school history, passing Colonel legend Rollie Schmidt’s (1962-1981) 90 wins three seasons ago. Sheptock has led the Colonels to two NCAA and seven ECAC playoff berths during his tenure, along with a MAC championship (2006). Wilkes made the NCAA playoffs in 2005 and 2006, going 19-4 overall, including a 42-0 win over Washington & Lee in the first round of the 2006 playoffs. Since 1996, Sheptock has coached 12 All-Americans and 133 All-MAC performers. John Marzka (Allegheny ‘91) enters his seventh season at the helm of the Albright College football program. Named head coach in 2007, he and his staff inherited a 2-8 team and have since directed one of the most impressive turnarounds in NCAA history. The Lions have amassed a 45-22 record and four post-season wins since Marzka’s arrival. His 74% win ratio prior to the start of the 2010 season was the best for any Albright football coach with at least three seasons leading the program, while his 26 wins are the most of any Lions gridiron coach in his first three years on the job. Marzka led the Lions to an 8-3 mark in 2012 and a spot in the ECAC South-East Bowl. This will be the 37th meeting between the two schools as Albright holds a 20-16 advantage in the series. Last season the Lions posted a 27-13 win at Schmidt Stadium. Albright has taken the last two meetings, with the last Wilkes win coming in 2010 in Edwardsville (38-35). The Colonels return home next Saturday after being away from Edwardsville for three weeks (since Oct. 5) hosting Stevenson University at Schmidt Stadium at 12:00 p.m.Wilkes holds a 2-0 advantage in the short season series between the two teams as Stevenson joined the MAC in 2011. 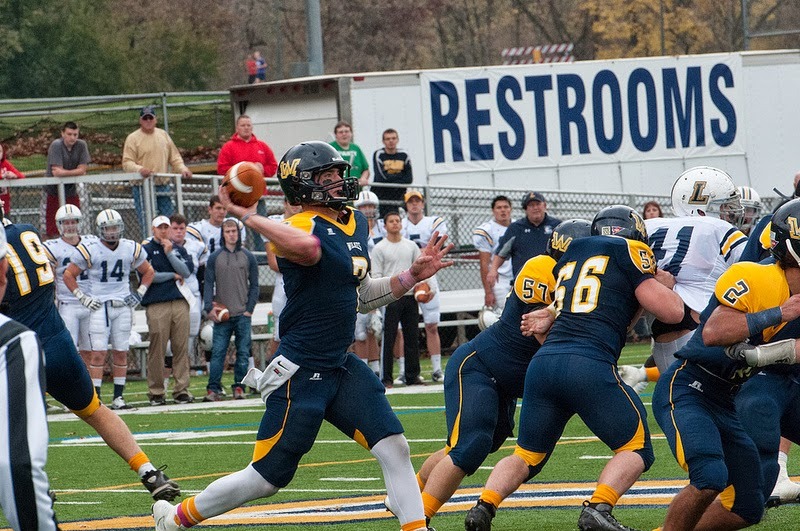 Wilkes earned its 300th win in the program’s 68 years of existence in week 4 at Misericordia. The Colonels currently boast a 300-302-8 (.498) overall mark heading into today’s contest with Albright. Going into today’s game against Lebanon Valley, Sheptock’s 105 wins stands as the school’s all-time leader. Sheptock’s 105 career wins has been built up over 17 seasons of work and includes a program-record 11 wins in 2006. He reached the 100-win plateau last season in a 37-27 victory against FDU-Florham on September 29. In 183 career games, Sheptock has a winning percentage of .573. • The series between the Colonels and Lions have featured high-scoring affairs. Over the past five seasons, Albright holds a 4-1 advantage in the series averaging 37.4 points per-game in the four wins. Wilkes has been steady offensively in the series too averaging 21.6 points each contest, including a 38-point effort in the 38-35 win in 2010. • Sophomore running back Patrick Ingulli ran for a team-high 26 yards in the loss against Lebanon Valley bringing his career total to 899 yards, just 101 shy of 1,000 for his career in just 15 games (59.9 yards per-game). • Senior All-MAC linebacker Tate Moore-Jacobs led the Colonel defense against Lebanon Valley as he has all season finishing with a game-high 11 tackles. With the 11 stops, Moore-Jacobs currently has 411 career tackles over his four-year stint in the Navy and Gold. Moore-Jacobs has reached double-digit tackles in 28 of 35 career games. • Freshman quarterback Taylor Young accounted for the Colonels lone touchdown against the Dutchmen running in a score from four yards out. He finished his second collegiate start throwing for 101 yards on 11-for-26 passing. He was pressured most of the afternoon though, finding himself on the ground eight times. It marked the most sacks given up by a Wilkes offensive line all season. • The Wilkes ground attack is widely known throughout the MAC as one of the top rushing offenses in the conference, but the Colonels have struggled this season averaging just 139.4 yards per-game (6th in MAC). Wilkes finished second in the conference last season averaging 232.4 yards per-game and led the league in 2011 (242.8 yards per-contest). • Rookie wide receiver David Claybrook is quickly emerging as one of the top outside threats in the league posting 18 receptions for 217 yards (8th in the MAC). His 54.3 yards per-game receiving ranks tenth in the conference. Claybrook is averaging over 4.5 receptions per-game through four games played for Wilkes. • In the special teams department, Jonathan Conklin is providing positive yardage in the kickoff return and punt return game for Wilkes through the first half of the season. Conklin is averaging 15.4 yards per-kick return (9th in the MAC) in seven attempts and 6.5 yards per-punt return (5th in the MAC) in 15 attempts. • The Colonels defense has been using a bend but not break style allowing 22.4 (6th in the MAC) points per-game, but using turnovers (6 interceptions/11 fumble recoveries) and situational stops to get off the field and setup the Wilkes offense. • Wilkes has been winning the turnover battle thus far this season collecting five interceptions and forcing a MAC-high 13 fumbles, with 11 being recovered by the Colonels. Teams are also just converting 48 percent (35-73) of the time on 3rd down and 18 percent (2/11) on fourth down. Wilkes caused three fumbles against Lebanon Valley two weeks ago recovering one of the Dutchmen miscues while picking off one pass. In the Colonels last two games, the defense has caused six fumbles (recovering four) and one interception. • Tate Moore-Jacobs is the league’s top tackler averaging 13.2 stops per-game. His 27 total solo stops rank third in the MAC, while his 39 assisted tackles lead the conference. • Albright boasts the highest scoring offense in the league averaging 33.0 points per-game. 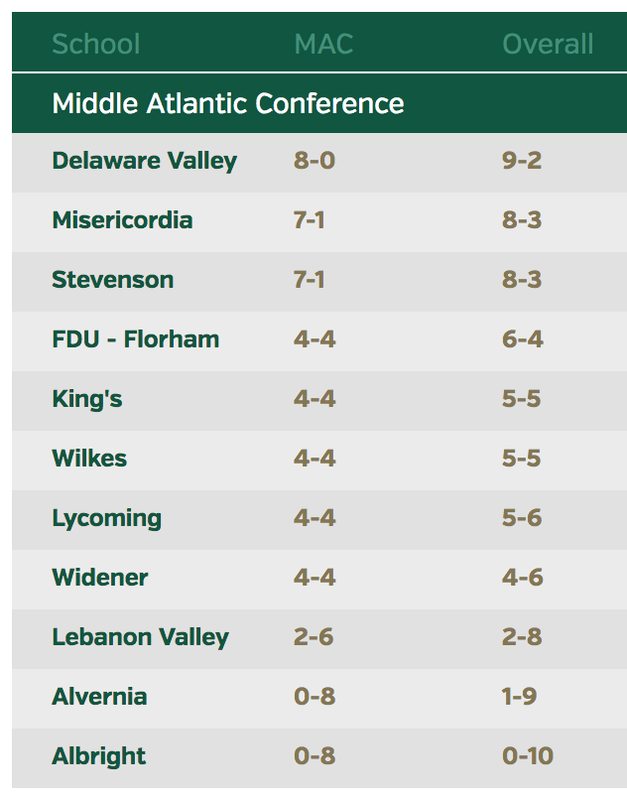 The Lions average 408.0 yards of total offense ranking second in the MAC only behind Delaware Valley. Most of the damage is done through the air where the Lions are second in the league in passing offense totaling more than 235.0 yards through the air per-game. • Quarterback TJ Luddy is second in the MAC passing totaling 1,136 yards on 84-for-140 passing. He has accounted for six touchdowns through the air, three going to wide out Daniel McNair. • Running back Ty Hughes is the fourth best rusher in the MAC averaging just under 100 yards per-game (99.4) through five games. His eight touchdowns on the ground rank only behind the conference leading rusher Misericordia’s Jeff Puckett’s nine scores. • The Lions defense features ten seniors in the starting 11, including senior free safety Drew Peterson who has a league-best five interceptions including one returned for a touchdown. • Two other Lions are ranked in the top ten in tackles in the conference as Levi Myers ranks seventh with 39 stops and Matt Hnatiuk ranks tenth posting 38 tackles on the year. • As a team, the Albright defense ranks second in the MAC allowing 306.2 total yards per-game.